TGIF! There’s been a lot of gossip regarding the royals this week and their apparent discord, although I don’t believe any of it. Leave them be! First it was Meghan’s apparently impressive work ethic (um, why is that considered a bad thing? ), then it was a rift between Prince Harry and Prince William, and now because the newlyweds have announced their decision to move to Frogmore Cottage, a rift between Kate and Meghan. While I’m not saying it’s impossible, every family goes through an adjustment period following a new addition to the family, and in this case, also the expansion/division of roles and a new baby on the way. I doubt they had a “falling out” as some media outlets are reporting, but I wouldn’t say tension is out of the question. It’s totally natural, especially when dealing with new inlaws! But who knows. Anyway, I’m team both. But to take my mind off the mindless gossip and frustrating news bulletins about them, I thought I’d feature another one of my favorite of Meghan’s looks so far since she married Prince Harry. 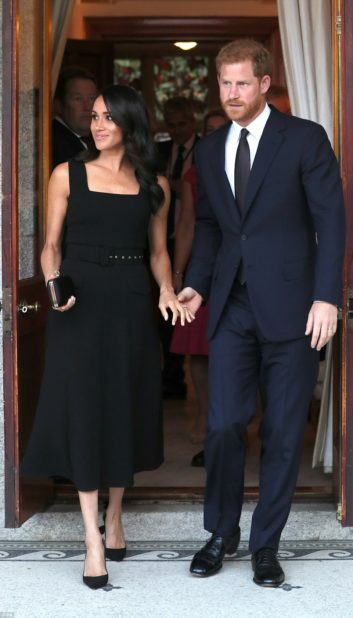 The Duchess of Sussex wore this chic black Emilia Wickstead midi to a garden party at the British Ambassador’s residence in Dublin, Ireland in August. This joint tour with Prince Harry to Ireland had multiple appearances, and you’ve already seen this look and this look from it here on the site. This trip likely gave Meghan a taste of what the upcoming Royal Tour was going to be like! I personally love the streamlined nature of this entire look, including her subtle makeup look and beautiful, wavy ‘do. Her hair was giving me major old hollywood starlet vibes, and I loved it so, so much! I think this silhouette is a knockout on her figure – the square neckline, cinched waist and A-line skirt are incredibly flattering and feminine. While her dress is not available, this look was pretty easy to recreate for less, because it is so simple! Obsessed. Of all the lookalike silhouettes I found, I prefer this one! It’s just under $220 and such a gorgeous option for a party, event or wedding. A year-round staple! For the best budget-friendly styles, don’t miss this under $20 number (and this one too! ), this $83 square neck look and this $40 dress. The Aquazzura pumps she wore to this event are finally back in stock in black! Her clutch is custom Givenchy, but this Judith Lieber clutch looks nearly identical! Check out this style and this one too if you are looking for a less expensive alternative. Both are on sale for under $50!